The below is from an email sent by Mecklenburg County Commissioner Jim Puckett who represents North Mecklenburg after CMS moved this week to withhold funding for municipalities supporting municipal charter schools. While Davidson did not participate in the vote for this permission, the move by CMS will clearly have impacts on residents in town. Sec. Johnson, Senator Tarte, Representative Bradford, in as much as the CMS board has codified what until now was only a thinly concealed practice of systematic denial of proper school facilities in the suburban towns of Cornelius, Huntersville and Davidson, I formally request from the North Carolina General Assembly and the Department of Public Instruction an examination and publication of the means and corollary effects rising from said examination of the formation of a separate school district for the towns of Huntersville, Cornelius and Davidson and their related Extra-Territorial Jurisdictions. As a result of the CMS Policy: Article II- Priority of Capital Spending in Certain Municipalities whereby the board of education has directed the Superintendent to limit future capital funding based on NCGA SL2018-3. This wanton abuse of power to deny taxpayers adequate capital funding due to options afforded under state and federal law must be met with the only appropriate action that being the ability to have a reasonable and legally defensible expectation that tax dollars taken by force are allocated without prejudice across the district from which those taxes are collected. While the Town of Davidson is not singled out in the above CMS policy her students will most surely be harmed as a result of denial to her neighboring towns when considering future high school building and to a lesser but still real extent middle schools as these facilities are regional and not town specific. CMS has put forth the argument that as a result of some towns choosing not to expand their options for providing adequate facilities even under the continued failure of CMS to do so, there should be some method of prioritization for those areas. To that end and as using the same misguided logic, I suggest all parents who do not have the financial ability send their children to private or religious schools should have the same opportunity for prioritization of their personal capital in the pursuit of educating their children and opting to withhold the +/- 45% of their property tax that goes to CMS and direct it to that end. I have spent most of the last 20 years trying to educate citizens of the unholy obsession at Charlotte Mecklenburg Schools to punish children who happen to live in areas of middle to upper social economic means outside the City of Charlotte. That reality was last noticed in the recent bond package that saw a reprioritization of CMS’s own school building schedule to move schools listed in north Mecklenburg down the priority list and nearly a decade from any real chance of being built. This inexcusable action led to the unprecedented need for the towns of Huntersville and Cornelius to request the ability to provide for their citizens in the face of clear discrimination. Lest there be any doubt of the punitive nature of the public school system one need only look at the actions codified in policy by the CMS board with this latest action. Not since the days of a dual school system has there been a more divisive and damaging action taken by those who claim to care about public education. aShortChronicle told readers just last week that citizens challenging the Griffith Street Hotel rezoning are in need of funds to defend their win in court from an appeal by the developers pushing the project. Well, it appears the community is stepping up in a big way. In the first four days of the drive, $4,930 has been committed towards a $10,000 goal that needs to be met by September 15th. According to information on the GoFundMe site, donations range from $10 to $1,000. It is also clear these donations are coming not just from those homeowners most directly impacted by the potential hotel project. Various names on the site as well as a $500 donation from Save Davidson organization show this is truly a community wide effort. This also debunks the myth promoted by the few who support this project that opposition is just an example of NIMBYism. It is about something much bigger. 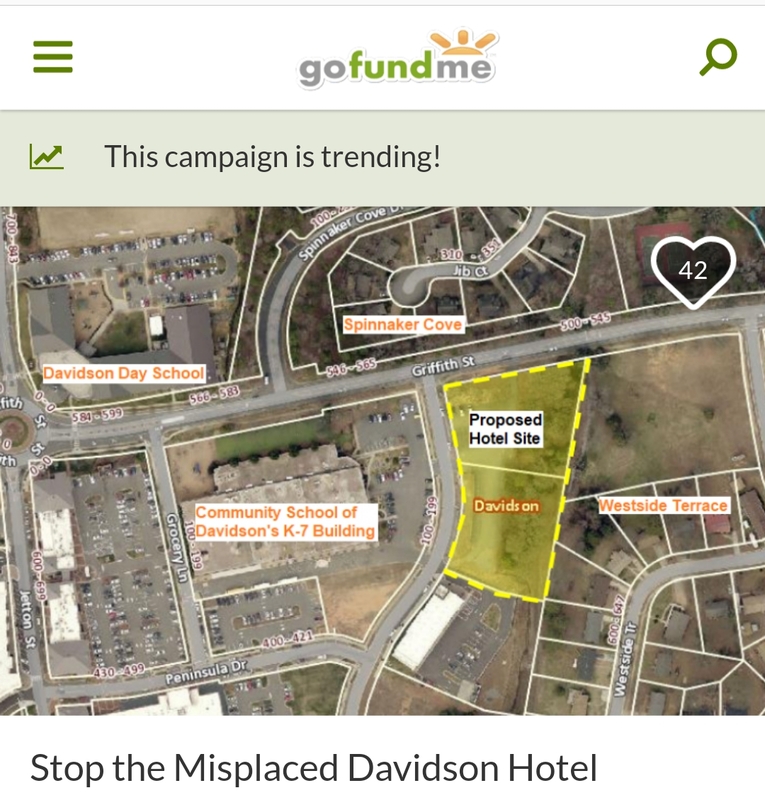 This effort, like the effort to save the Beaty Street Property last year, has become about stopping inappropriate development in the wrong place that negatively impacts Davidson's small town character and holding Davidson Town Hall accountable for mishandling decisions for the people it represents. 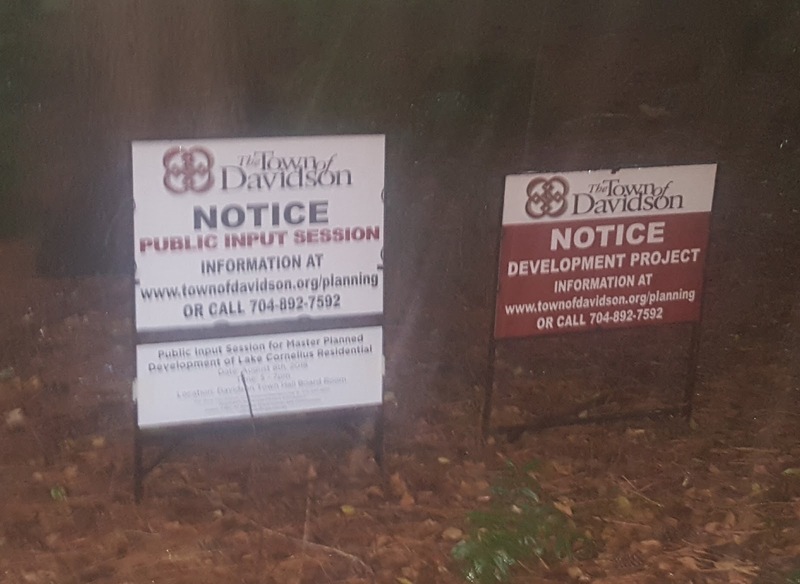 Citizens won this case in the initial hearings because Davidson Town Hall admitted it erred on not one but two separate issues, violating the Davidson Planning Ordinance and NC law. Now, they have to defend that victory against an appeal by developers who want this project to go forward anyway. 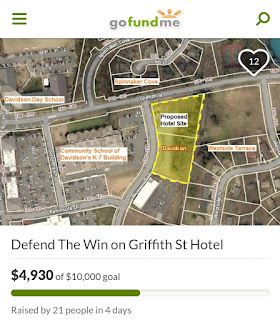 With the fundraising effort already at 50% of the goal, the citizen plaintiffs and the larger community definitely can reach the finish line and provide the effort the resources it needs to meet this challenge. That is what's needed from here, so please think about what you can contribute. Also, please think about how you will feel if this effort falls short and eventually there is a hotel on that spot where you know there shouldn't and couldn't have been. Your piece of mind knowing you did what you could to stop that is worth it! 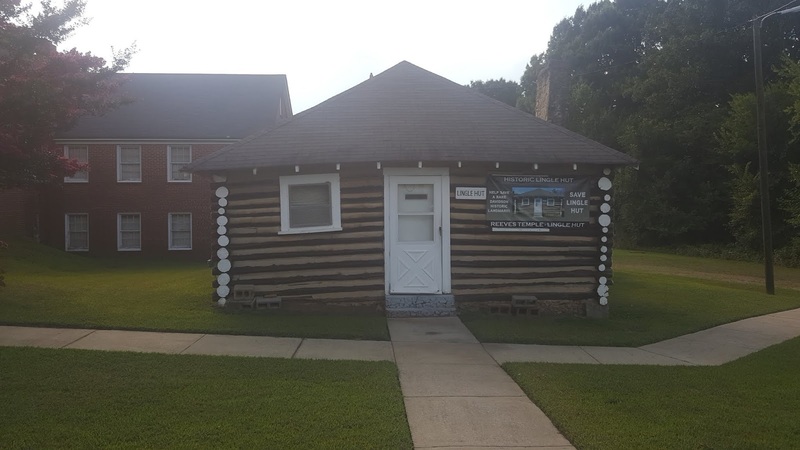 aShortChronicle previously told readers about efforts to restore the historic log building on Davidson's Watson Street called the Lingle Hut. 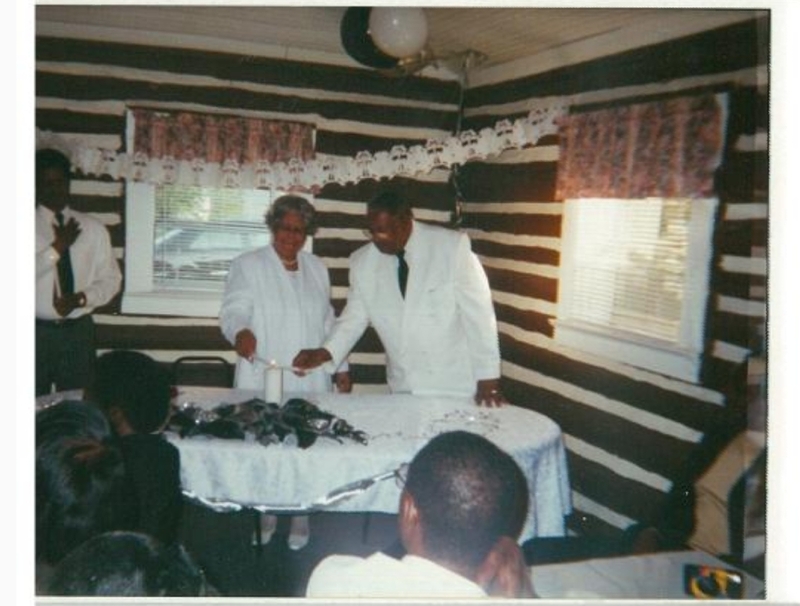 The "Hut" as it's called had long been a gathering place for Davidson's Westside Community as part of Reeves Temple AME Zion Church. The church at this location and the Hut also have a connection to the College. See this earlier post for more on that aspect of the story that makes the hut part of the fabric of Davidson . 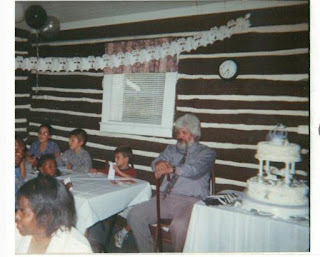 However, in recent years the Hut has fallen into disrepair and can no longer host the community activities it once did. For a taste of what's missing, check out the pictures at the bottom of this post for snapshots of what used to take place here. Seeing a need and with a well known history of community activism, Kurt and Maria Naas of Cornelius have been coordinating an effort to raise funds to get this building back into shape. For the past several weeks, they have been organizing bi-weekly meetings of church members and community volunteers at the Davidson Library to come up with a game plan to raise awareness and hopefully some money to get the effort off the ground. According to recent meeting minutes provided to aShortChronicle, these efforts appear ready to swing into a higher gear. The group will be presenting at the upcoming Davidson Town Board meeting on September 11. They also plan to be at the Davidson Farmers Market in later in the month on the 29th and next month on October 6th. And if things continue to go well there will be a carnival/fundraiser in October to raise funds for the project. If this sounds like something you'd be interested in helping make a reality stop by the Davidson Library this Thursday at 6:30 for the next meeting. Fighting the good fight can at times be a lengthy and frustrating process. 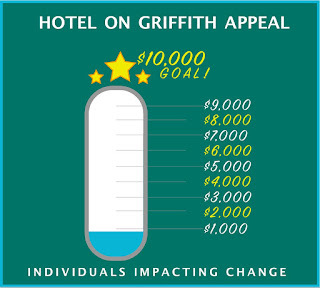 That is certainly the case for the plaintiffs in the Griffith Street Hotel lawsuit. 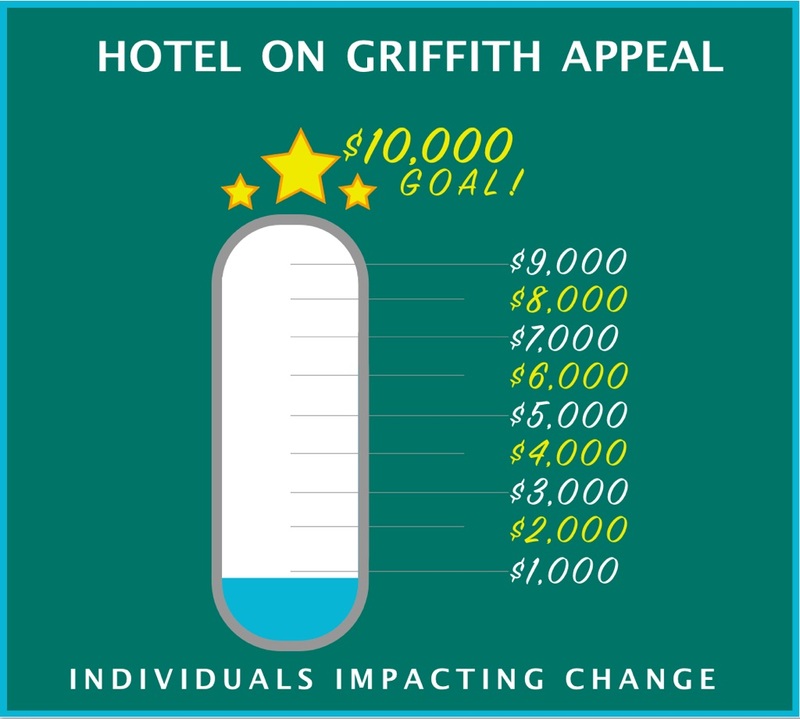 After having won their case in Superior Court with a court order from Judge W. Robert Bell on motions heard back in May, the plaintiffs (residents) in the Griffith Street Hotel lawsuit are now facing an appeal of that decision. The appeal is being brought by the developer and landowner defendants. Interestingly, the Town of Davidson, itself a defendant, is not officially part of the appeal. aShortChronicle broke that news here last month. While appeals based on legal minutiae are a standard part of the legal process, there is also a common sense way to view this situation. Davidson residents impacted by this out of place development have successfully won a judgment that voided the rezoning allowing the project, a judgment handed down by the Senior Resident Superior Court Judge, W. Robert Bell. Judge Bell has served Mecklenburg County for over 20 years. As one of the defendants, the Town of Davidson admitted to not following proper procedure in not just one, but two separate instances during the rezoning. In spite of all this, the other defendants, the developer and the landowner, are appealing in hopes they can...effectively...get away with it somehow. the Town admitted it did wrong. With that as the backdrop comes word the plaintiffs have launched a $10,000 fundraising effort over the next few weeks to fund this next phase. Notice of this effort came in an email from the lead plaintiff, Luke Charde, on Monday. While straight donations in any amount are appreciated, the plaintiffs are also offering an option for those willing and able to donate more sizable sums - a loan. "The NC statute, on citizen suits against a municipality, provides that, if the municipality loses, the court MAY impose attorney fees against the municipality; but the statute then goes on to say, that if the municipality lost because it committed an "abuse of discretion" then the Court MUST award attorney fees against the municipality. That's precisely where we are. The Town lost because , in processing the development application, The Town failed to follow not one but TWO, distinct, separate, and unrelated provisions of the Town of Davidson Zoning Ordinance. " The loans made to this fund will be first in line for repayment if and when the Town is forced to pay the plaintiffs' attorney's fees. It is requested the loans be for a minimum of $500. $10,000 may seem like a lot of money to raise, but as the saying goes - "many hands make light work". Please be generous and make a donation or consider making a loan if you are able. A GoFundMe has been set up to help collect funds. If you are interested in making a loan to the fund, a copy of the loan agreement can be found here. These can be mailed to the same PO Box. This fight has already been a long one, and it seems it will go on a little longer. However, if the community comes together to help these residents they will at least have the resources to see it through. With school starting it is time to get ready for Davidson Wildcats Basketball season. The below is from an email recently distributed by the College Athletics Department on behalf of Coach Bob McKillop. Join us Thursday, August 23, from 6:30-8 p.m. for a complimentary and fun event designed to get our fans energized for the upcoming season and give you “inside knowledge” of how we run our program. Below is a list of our “Inside Look at the ’Cats” schedule, so take a look, grab a friend or two and come see us at John M. Belk Arena in Baker Sports Complex on the Davidson College campus. 6-6:30 p.m. – Fast Break Club EXCLUSIVE “pre-event”– open to all returning members as well as new members (including those who sign up at this event). Enjoy complimentary food, soft drinks, beer and wine, and mingle with new Athletic Director Chris Clunie ’06 and the men’s basketball coaching staff. 6:35-7 p.m. – Session I: Check out the new “Above the Rim Concourse,” and enjoy a complimentary beverage from NoDa Brewing as Associate Head Coach Matt McKillop ’06 presents on the scheduling philosophy of Davidson basketball as well as a Q&A session with fans. 7:05-7:30 p.m. – Session II: Head Coach Bob McKillop breaks down film and gives you the Xs & Os of Davidson basketball, plus a Q&A session with fans. 7:35-8 p.m. – Session III: Learn more about the recruiting strategy and plans of Davidson basketball with Assistant Coaches Will Reigel ’10 and Kevin Kuwik, plus a Q & A session with fans. 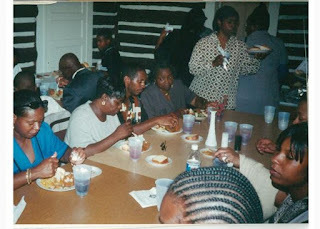 8:05-8:30 p.m. – Fast Break Club EXCLUSIVE “post-event” -- open to all returning Fast Break Club members as well as new members (including those who sign up at this event). Enjoy complimentary food, soft drinks, beer and wine. Chris Clunie ’06 and Bob McKillop will address our Fast Break Club members. There will be time allotted for Q&A at the end of this program as well. So, please join us for a fun night of fellowship and Davidson basketball. Spread the word, bring a friend and tell your friends to bring a friend. We’ll see you August 23! The Beaty Street Conceptual Plan Task Force, made up of 14 Davidson citizens, has scheduled a number of public input opportunities to gather feedback from citizens regarding the Beaty Street property.  Park at Beaty Pinterest Board; e-mail ParkatBeaty@TownofDavidson.org to request posting privileges.  Guided Beaty Property Hikes: if you missed the first hike in August, there’s still a chance to get a first-hand glimpse of the property: Aug. 17 (1 to 2 p.m.) Sept. 2 (2 to 3 p.m.); Sept. 21 (1 to 2 p.m.); Oct. 7 (2 to 3 p.m.); Oct. 19 (1 to 2 p.m.); Nov. 4 (2 to 3 p.m.); Nov. 16 (1 to 2 p.m.). Hikes meet in cul-de-sac at 203 Hobbs Street.  Public Input Idea Wall, Town Hall Rotunda, from now through Feb. 18. Bring photos, magazines clippings or sketches of park ideas that appeal to you.  Back-to-School Breakout, Gethsemane Baptist Church, Aug. 18, 10 a.m. to 2 p.m.
 Public Input Session #1, Davidson Town Hall, Sept. 17, 5:30 to 7:30 p.m.
 Public Input Session #2, Gethsemane Baptist Church, Nov. 5, 5:30 to 7:30 p.m.
 Public Input Session #3, Davidson Town Hall, Jan. 14, 5:30 to 7:30 p.m. The citizen-led Task Force was appointed by the Davidson Board of Commissioners in late May and charged with soliciting input from Davidson citizens to identify park and recreation needs along with ancillary public amenities in keeping with the natural, park-like setting of the property. Early in the year, the Board of Commissioners voted to preserve nearly 20 acres along Beaty Street for a park. The property is bordered on its west side by Beaty Street (across from the Ingersoll Rand area). On its east side it is bordered by the railroad that runs behind homes along Main Street. The property is home to hardwoods and is primarily made up of tree canopy. Citizens can find more information at townofdavidson.org/parkatbeaty. 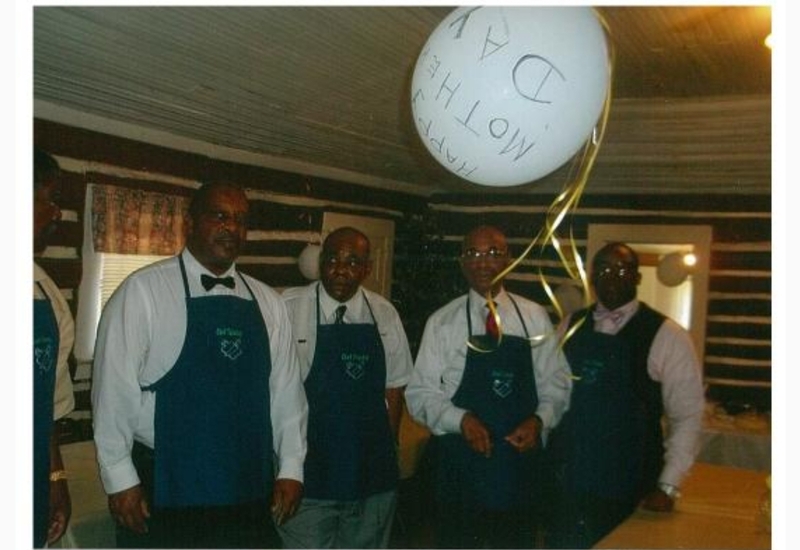 Task Force meetings are the 1st and 3rd Wednesday of each month at 6:30 p.m.
DAVIDSON, N.C. – The Town of Davidson is now accepting nominations for the G. Jackson Burney Community Service Award through September 28. The award honors G. Jackson Burney and those who improve the Davidson community through unselfish service. 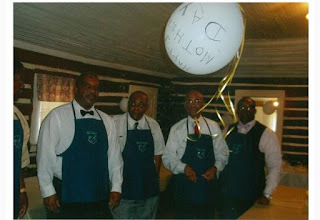 The annual award is presented in late November or early December at a community event at town hall. Jack was a true friend of Davidson. He led a life dedicated to improving the quality of life for all around him, and that was especially true in his dealings with the town. 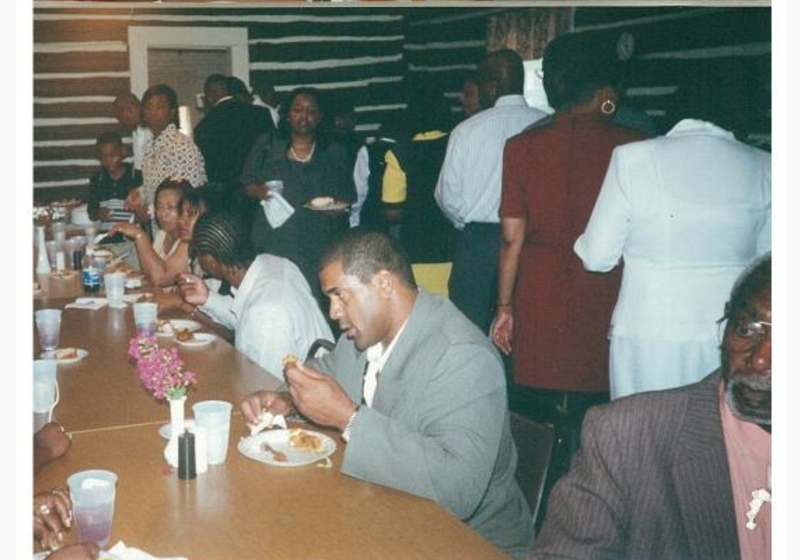 In his professional life, Burney helped to create the Charlotte Census tracts for the U.S. Department of Commerce, and he managed the Charlotte Chamber Economic Development program for ten years. He was a White House delegate to a conference on Balanced Growth and Economic Development and a technical advisor to the North Carolina Governor’s Conference on Balanced Growth. In his personal time, Jack founded the Town Message and published several other newsletters, including one for the downtown Davidson organization. 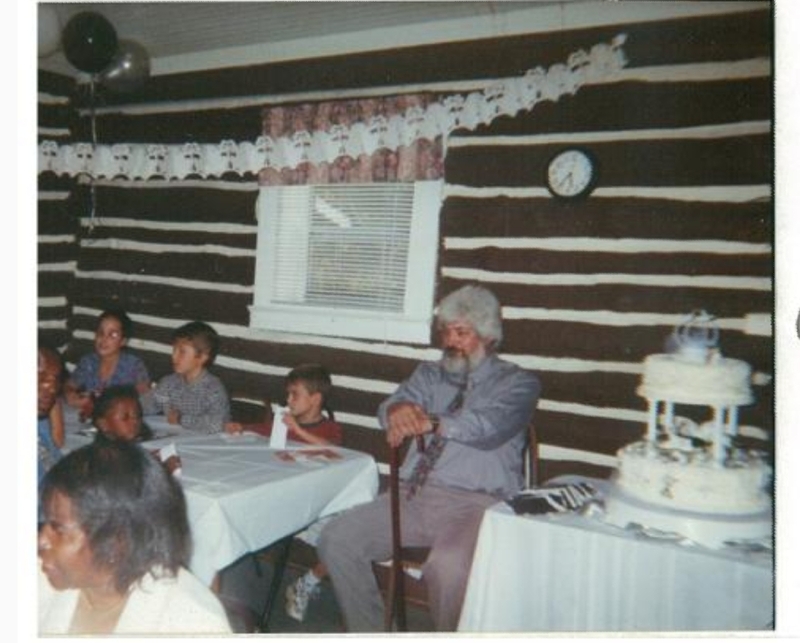 Jack provided support for town initiatives by volunteering his organizational, critical analysis, and leadership skills. More information is available on our website atwww.townofdavidson.org/burneyaward. Nomination forms are available online atwww.townofdavidson.org/burneynomination and at Davidson Town Hall. The deadline for submissions is September 28, 2018.
aShortChronicle caught up with Eric Wood of Nest Homes on Monday to get the lowdown on the story erroneously reported here last week. 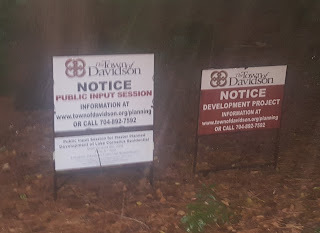 That story was regarding a new development on the shores of Lake Davidson - or for those who don't like the "Lake Davidson" moniker, "that portion of Lake Norman separated from the main lake by I77 and connected through a big pipe that partly abuts the Town of Davidson". For the sake of brevity, we'll just call it the possible new project on Lake Davidson. The project's name is The Province at Lake Norman. According to Wood, there is in fact a project in the works, but it is in the earliest of planning stages. There have been a few focus groups, and they have been well attended for a project that would be something like The Pines, as in a facility including health care services for tenants in the 70+ age group - mostly 75-85. Phase 1 of the project would include a 50,000 sqft Clubhouse and Wellness Center along with condo style units numbering somewhere around 200. The project called "The Province at Lake Norman" would differ from "The Pines" in that it would be run on an equity model rather than having an entry fee and regular payments. Wood said it would be more like "The Cyprus" of Charlotte in that respect. When asked what "Phase 1" looked like compared to a full buildout, Wood said full build out would be somewhere between 3 and 5 units per acre for the 100 acre project in a mix of multi-family and single family cottages. Per Wood, that's significantly less than what could have been built there under the previous zoning. It also needs to be noted that Wood passed along he thought the project would be "lucky" to break ground within the next 36 months. That means nothing is imminent. As a Continual Care Life Plan community involving some level of Health Care Services, the project will be subject to regulation by the NC Department of Insurance. That will add to the complexity of the project and the planning required. Wood also indicated that the nature of the project involving seniors was s factor in requesting an increase in the number of allowed floors from 3 to 5. That will allow for a more compact plan with buildings closer to wellness facilities. Wood also stressed the project will make significant efforts to minimize environmental impacts, acknowledging that the project would be something new in the lake community. He did say that direct boat access wasn't expected as part of the plan and that amenity hadn't been requested during the focus groups so far. As for the incorrect diagram published in the earlier post here at aShortChronicle, that didn't come from the Province project. Wood confirmed that no diagram was sent with the letter announcing the focus groups. That was done intentionally to not skew the focus group feedback. He did however say some drawings would be made available once the focus group sessions were complete and feedback incorporated. It was also confirmed that the project being planned by Nest Homes and R.L. West Properties is on the Transco Rd peninsula into Lake Davidson. That's across the cove from Davidson Pointe. aShortChronicle will be sure to pass along those correct drawings on when they are available. DAVIDSON, N.C. – The Davidson Police Department has changed the dates and times during which the medicine drop box is open outside the west entrance of Davidson Town Hall, near the police department. The drop box will be available every other Monday, beginning August 13, from 8:00 a.m. until 5:00 p.m. Please do not dispose of empty containers in the medicine drop box as they can easily be recycled in a household’s recycling container. Please remove all personal information (name and address) from the container prior to disposal. 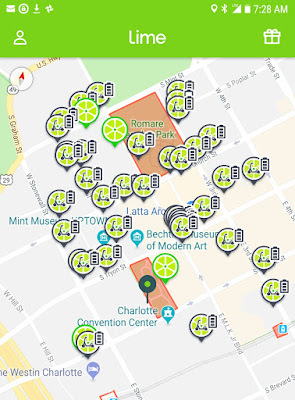 aShortChronicle has previously told readers about the Dockless Bike Share phenomenon that over ran Uptown Charlotte earlier this year. Davidson College also started a similar program here in town targeted towards College students. 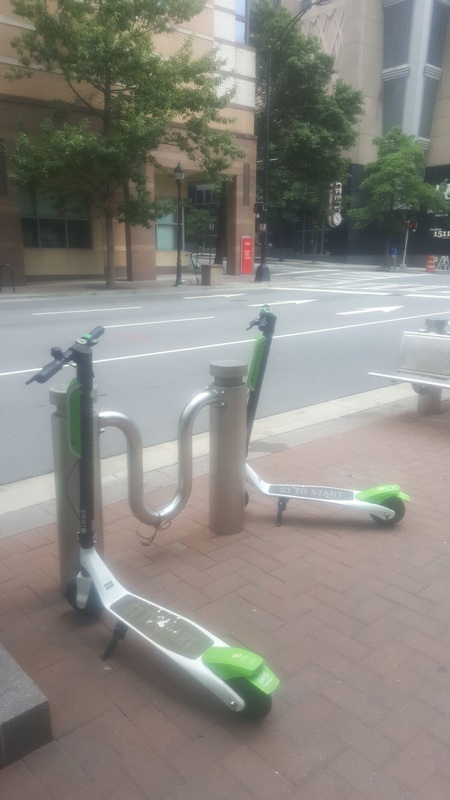 We also told you about the electric scooters which hit the streets of Uptown a few months later. What we didn't expect was how the popularity of the scooters would significantly impact the use and availability of the bicycles. When the dockless bike shares hit the streets there were roughly 2000 bicycles scattered all over Uptown from four different vendors. The bicycles were ubiquitous. They blocked sidewalks, were left all over the place, and generally where as much nuisance as useful form of transportation. 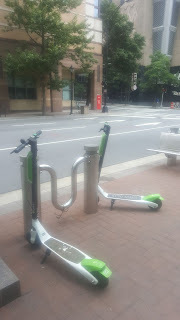 What has been surprising is not only the popularity of the scooters, but how quickly it has culled the herds of bikeshare units. After just about four months in the market and two months after the scooters hit the streets, Ofo - the last of the bikeshare vendors to enter the Charlotte market - has left. The below email was sent out in late July to subscribers. However, reducing the number of vendors isn't the only impact to the bicycle operations. The remaining bikeshare companies, while still operating, appear to have also cut back the number of units in Uptown. Interestingly, this includes LimeBike which operates both bicycles and scooters. Take a look at the below from LikeBike's app. Most of the units are now scooters. Anecdotally, the use of the scooters seems to far surpass what the bicycles ever achieved. For Uptown and South End residents they have become a viable commuting alternative with office workers seen regularly using them in the AM on their way to work. 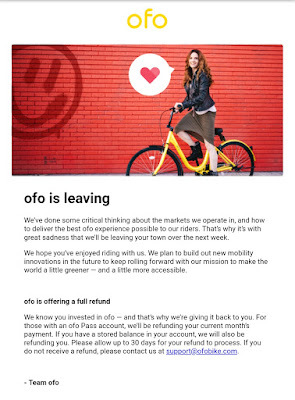 But one has to wonder if their own popularity will eventually lead to the demise of the rentable scooters as well? 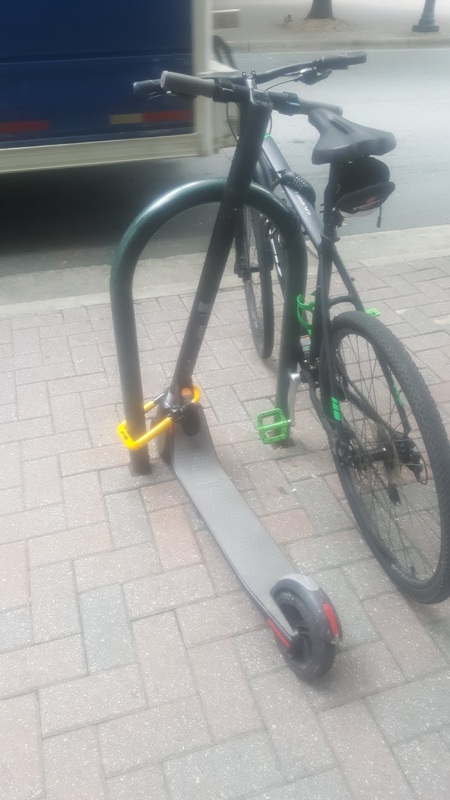 aShortChronicle recently saw a privately owned electric scooter locked to a rack. Will the next trend among center city residents be buying their own scooters rather than renting them? This has never been done before at aShortChronicle, but there is a first time for everything. A story is being retracted. Yesterday's post on a possible large retirement development north of Davidson off of Bridges Farm Rd contained a diagram depicting the location of the project and that diagram appears to be inaccurate. Since that drawing was the basis for much of the post this warrants a retraction. The source providing the information said they were positive the diagram was distributed with the referenced letter. However, there was a rezoning this week in Mooresville that references another nearby property that also fits the description in the letter. Additionally, the listing agent for the pictured property says there is no such activity underway. Additional verification will be done in coming days and an update provided. Apologies, for the confusion and concern this may have caused. This kind of thing is something we work hard to avoid, but if a mistake is made it will be corrected. UPDATE - 800+ residences coming to Bridges Farm Rd? Update #2: Upon review of the agenda if the most recent Mooresville Board meeting, there was a rezoning request that looks similar to the description of the described project, but in a different location than the picture included in this post. That being the case this post is being redacted until further verification can be completed. Update: An individual stating he is the listing agent for the property pictured has indicated nothing is in the works for this property and that the diagram pictured is an old version of a previous project and that no rezoning is in the works. Additionally, aShortChronicle incorrectly said thd project was on the south side of Bridges Farm rd, when the picture (that is apparently incorrect) depicts it on the north side. 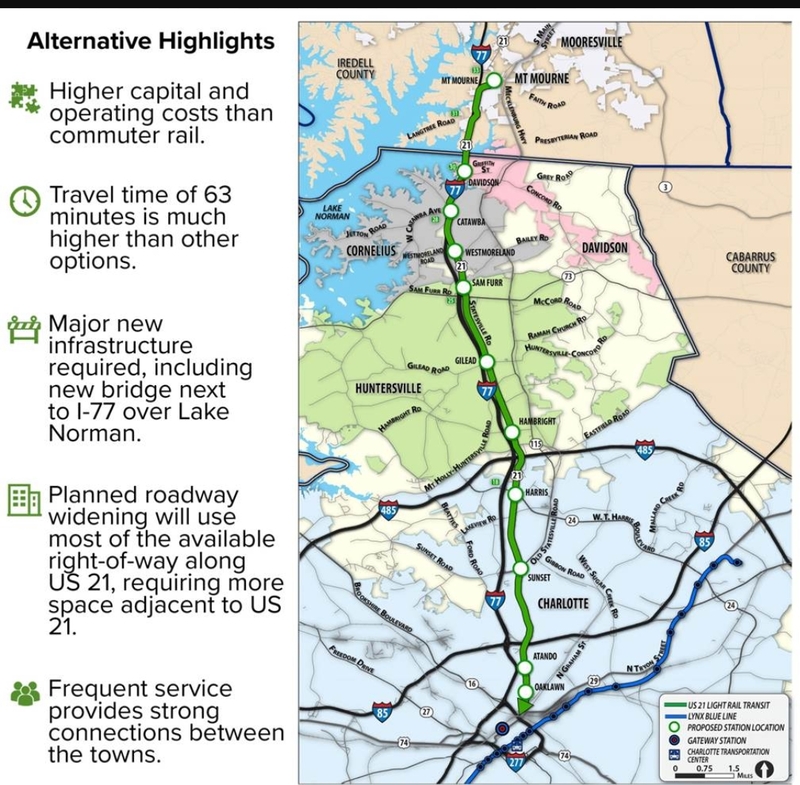 No, this isn't the second coming of the Lake Davidson project turned back by citizen concern last year. Instead, it looks like a second major new development may be in the works just north of Davidson over the Iredell County line on the north side of Bridges Farm Rd. That is what one can surmise from a letter and landscape diagram circulated early last month in the area. That totals roughly 800 residences in what looks to be a massive senior living community. In a letter that was mailed to people in the area dates early July, the project is described as a 100 acre "Life Plan Community" for people 60 - 75 that will "offer a full continuum of healthcare services, if ever needed." There will also be a commercial component and a 50,000 sqft clubhouse. To gather input on the project the developer is holding a half dozen focus groups. Two were held in July with four in August including one today, August 8th, at River Run Country Club in Davidson at 10am. The letter says developers on the project include Nest Homes and R. L. West Properties. The property is currently zoned R3 which means a rezoning will be needed to move it forward. Lake Cornelius Residential: A public input session will be held Wednesday, August 8 from 5:00-7:00 p.m. in the board room at Davidson Town Hall. The purpose of the meeting will be for the project owner, Meeting Street Homes & Communities, to discuss with the public their proposed master plan for 14 single-family homes on Catawba Avenue. For additional information, including a map of the project location and the submitted plans, please see the project webpage . North Harbor Club CPA (Conditional Planning Area): A public input session will be held Wednesday, August 29 from 5:00-7:00 p.m. in the board room at Davidson Town Hall. The purpose of the meeting will be for the project owner, The Lake Norman Company, to discuss with the public their proposed improvements to the North Harbor Club restaurant and the office building located at 400 North Harbor Place. For additional information, including a map of the project location and the submitted plans, please see the project webpage . Signage has been up for the first session with signs per the "Judge's Order" placed at the end of Catawba Avenue. Per the Town, signage will be placed for the 2nd per DPO Section 14.4.1.C which states signs must be placed at least 10 days prior to the session. DAVIDSON, N.C. – Are you interested in getting involved in shaping Davidson’s future? The Town of Davidson is now accepting applications for 2018 appointments to its advisory boards. Consider serving on the following: Design Review Board, Planning Board, Livability Board, and the Davidson Public Art Commission. New members will serve a three-year term from January 2019 to December 2021, with a possibility of a second term. A nominating committee will review all applications and nominate citizens for each available position. The Davidson Board of Commissioners will vote on nominees, and appointees will be seated on their respective boards in January 2019. Information on advisory boards is available at www.townofdavidson.org/advisoryboards and the application is at www.townofdavidson.org/advisoryboardapplication. Applications are also available at town hall. All applications are due by September 28. For more information, please contact Town Clerk Betsy Shores at bshores@townofdavidson.org or 704-940-9610. At Tuesday's Davidson Board meeting, Commissioners are set to vote (or maybe they won't) on putting $16.3 million in bonds on the November ballot. These bonds will be for "public facilities". These bonds, if passed in November, will be used to improve facilities for Public Safety at the existing Town Hall and to build a new Davidson Town Hall. The plan for a new Town Hall being discussed since soon after the new board was seated is to enter into an agreement with CMS to refurbish the Davidson IB Middle School on South Street to serve as the new Town Hall and offices for CMS. This is different than the plan the previous board was discussing which was to build a brand new Town Hall in front of the existing Town Hall on Main Street. Interestingly, both plans come out to about the same amount of money. In preparation for this Tuesday's vote and to gather some public input on the subject, Davidson is using its "Open Town Hall" survey tool to get citizen responses. To date over 80 responses have been submitted with results evenly split between the IB School plan and "Other" with several people voting for the Main Street plan. The "Other" category is broadly variations on doing something smaller at the IB site or doing nothing at all. A major concern was noted by several respondents regarding spending so much money on a building the Town does not own. It should be noted that while this survey is not scientific, it has garnered the most responses of any survey done on this platform for Davidson. It should also be noted that a similar survey done on the Save Davidson Facebook group showed overwhelming opposition to spending this much money on a new Town Hall. Again, while these types of surveys are not scientific, these results do indicate that if a bond referendum is put on the ballot for $16 million, it will likely be a divisive vote for the Town in November. What bothers aShortChronicle as much or more than the dollar amount or the possibility of a spirited Bond referendum campaign is the possibility that even if these bonds are approved they might not be used for what voters think. That possibility stems from the way these bonds have been designated. The recent discussion has been all about the IB Middle School remodeling for the new Town Hall. Yet, the bond order wording being discussed just says "public facilities". While that difference may seem insignificant, it is not. The way bonds work drives this wording. Bonds can only be spent on what they have been designated to be used as worded on the ballot. The Town could have submitted a bond order specifying these would only be used for the South Street IB Middle School version of a new Town Hall. That's the version the Board has been discussing these past months. By wording the bond order using the more generic "public facilities" description, in theory this money could be used for anything falling under that much broader category - including the new Town Hall idea on Main Street. Voters have to ask themselves this question. "What happens if I support these bonds for the South Street project, but then something falls through? Will that money be used for something else like the Town Hall on Main Street?" While aShortChronicle truly does not believe the current Board would intentionally do this, the wording on the bond order is concerning because it allows for the possibility. aShortChronicle sat through a bond presentation years ago where the Town's outside bond legal counsel specifically advised using such generic language to the previous Board so this type of thing could be done. It provides flexibility, but flexibility is not always a good thing. Since bonds have a shelf life of several years, if they aren't used immediately by the current Board for whatever reason, a future Board could change direction. 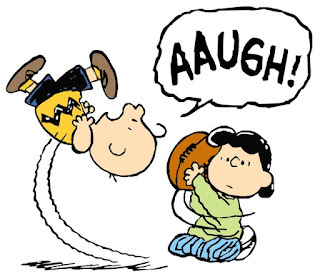 Avoiding both a divisive November vote and the possibility of a "bait and switch" could have been done. The bond amount should have been divided into two pieces - one for Public Safety and one for a new Town Hall. It should have been worded that way instead of the generic "Public Facilities" to cover both. The Town also should have done more to significantly cut costs on the projects to get the number down to something more reasonable. Unfortunately, those steps weren't taken, and here we are. The Board does have the opportunity to lower the bond amount on Tuesday. It says so on the meeting agenda item. That could cover both problems. Instead of a $16 million bond, they could go with something like half that - enough to do the public safety work and more modest updates to the IB School for Town Staff, but not enough to switch plans and do the Main Street Town Hall. Voters will have to wait until Tuesday to find out if the Board takes that opportunity. 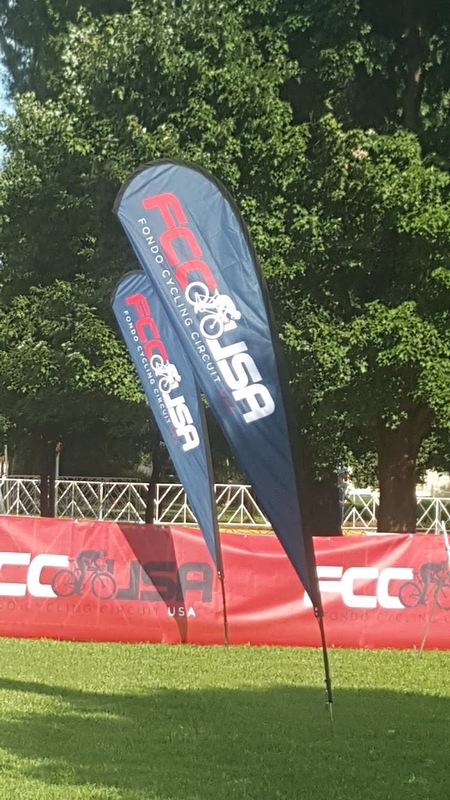 DAVIDSON, N.C. – Davidson will host the Gran Fondo Series USA bike race on Sunday, August 5. The Gran Fondo is a type of long distance bike ride which originated in Italy in 1970. Three rides will be offered, all starting at 8:00 a.m.: 30-miles, 50-miles, and 75-miles. The ride will originate on Lorimer Road by the town green and head east out of town on Concord Road (see map links below). Cyclists will return to the green upon completion of their ride for an awards ceremony, food and craft beer festival, and live music. The event organizer anticipates approximately 400 cyclists. STREET CLOSURE: Please be aware that Lorimer Road will be closed from the CVS parking lot to Concord Road from Saturday, August 4 at 6:00 p.m. until Sunday, August 5 at 6:00 p.m. The race and after party will take place during the day on Sunday, August 5. All bike riders are asked to park in the public lots along Jackson Street. Downtown parking for Sunday church services may be impacted by this event. New Davidson Board meeting schedule starts in August. Starting at 7pm rather than the normal 6pm ensures the Davidson Board will be meeting late into the evening on Tuesday. The late start for the Board Meeting is most likely due to the National Night Out which is scheduled on the same evening and Commissioners need to attend both. Long-time watchers of Davidson Town Hall may be thrown off by the "1st Tuesday" meeting time. This is a part of the new meeting schedule passed by the Board back in May as part of the May 8th its consent agenda. • Coffee chats: We will cancel the May 21 coffee chat. The board of commissioners will consider hosting coffee chats at Davidson Town Hall quarterly starting in September (two at 9:00 a.m. and one at 6:00 p.m.). We will use Open Town Hall to seek citizen input. For citizens, it appears the biggest impact to this change surrounds when public comments will occur. Public comment on issues will be on the 4th Tuesday meeting which is the "Regular" meeting. What this means in practical terms is that if citizens want to make a public comment on an issue, they have to go to the 4th Tuesday meeting to speak on things that may be voted on that night or the next two Work Session meetings since there will now be 3 meetings per month with potential for votes rather than just 2. DAVIDSON, N.C. – The Town of Davidson’s Beaty Street Conceptual Plan Task Force, made up of 14 Davidson citizens, is currently working to develop an overall project timeline to make the park on the 19 acres of town-owned land along Beaty Street a reality. The citizen-led task force was appointed by the Davidson Board of Commissioners in late May and charged with soliciting input from Davidson citizens to identify park and recreation needs along with ancillary public amenities in keeping with the natural, park-like setting of the property. Early in the year, the Davidson Board of Commissioners voted to preserve nearly 20 acres along Beaty Street for a park. The property is bordered on its west side by Beaty Street (across from the Ingersoll Rand area). On its east side, it is bordered by the railroad that runs behind homes along Main Street. Citizens can find the survey link and other information at www.townofdavidson.org/parkatbeaty. -Assessment of natural resources on the property. Mecklenburg County has just completed a summer plant inventory and will discuss findings at an upcoming task force meeting. Two other plant inventories are planned for the fall and the spring. -Research of existing parks to gather ideas and share with the public. -Evaluation of the legal elements of the Beaty Street park land, assessment of the suitability of lands adjacent to or near the park for possible expansion of park’s footprint, and evaluation of strategies for permanently conserving the park. -Development of public input strategies. In addition to surveys, other public input opportunities are in the works. Among them: A hike series on the property (begins in August), an idea wall in the Town Hall Rotunda, a Pinterest page, a Back-to-School event, and public input forums. When public input dates and opportunities are finalized, the task force will share them through the Town of Davidson and other outlets. Task force members: Ellyn Baeszler, Denise Beall, John Burke, Dave Cable, Leah Chester-Davis, Heidi Dietrich, Gary Fagan, Peter Grisewood, Janet Makee, Bill Maloney, Karen Manfredi, Jason Parker, Gabriel Schoen, and Alice Sudduth. Kathryn Spatz, Davidson Parks and Recreation Director, is the staff member working with the group. Chris Matthews, Mecklenburg County Park and Recreation, and Gary Fankhouser, ViZ Design, also are providing professional support to the group. For more information, updates and survey links: www.townofdavidson.org/parkatbeaty. DAVIDSON, N.C. – Please join the Davidson Police Department on Tuesday, August 7 from 5:00 to 7:00 p.m. at Roosevelt Wilson Park (420 Griffith Street) to celebrate National Night Out. The event is free and open to the public. On-street parking will be available. 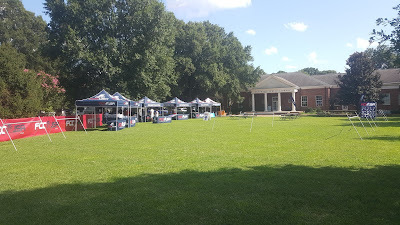 National Night Out is an annual crime prevention and community-building event, sponsored by the Davidson Police Department to promote involvement in crime prevention activities, police-resident partnerships, and neighborhood cohesiveness. We will serve hot dogs and hamburgers, courtesy of Brickhouse Tavern. 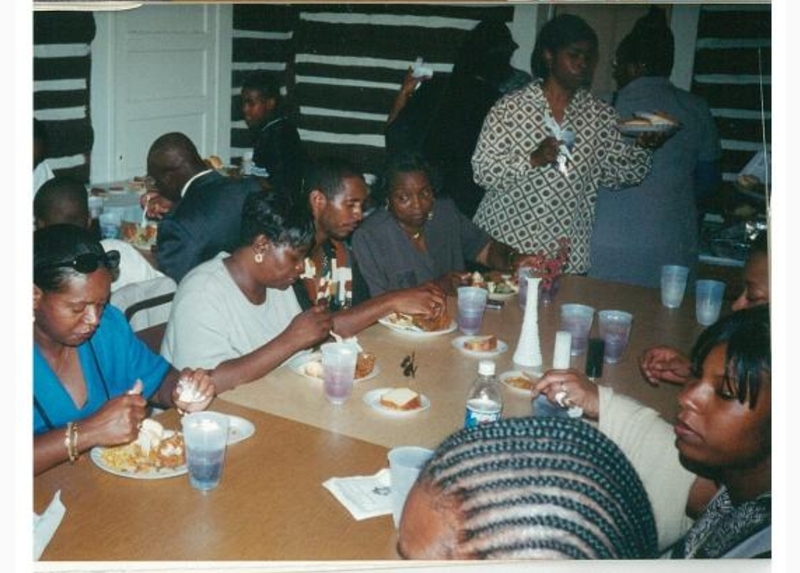 We encourage Davidson residents and employees to attend and bring a side dish or dessert to share. A variety of groups will be present to educate our citizens: North Mecklenburg Crime Stoppers, Mecklenburg County’s District Attorney’s office, MEDIC, Mental Health Association, Charlotte-Mecklenburg Police Department Communications, Safe Alliance, Mecklenburg County Sheriff’s Office, Davidson Fire Department (with a fire truck), and CharMeck Alerts. In addition to Brickhouse Tavern, we appreciate the generosity of Harris Teeter, Homewood Suites, Mandolino’s, Flat Iron, The Village Store, Main Street Books, and many others. 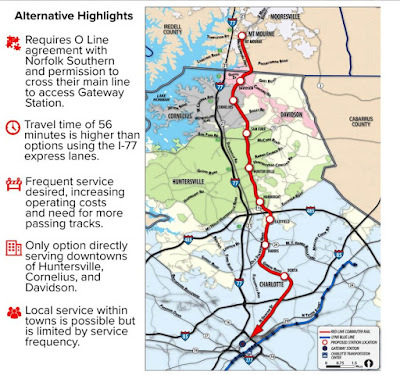 The CATS mass transit sales pitch rolled into Davidson Town Hall on Tuesday evening to discuss the options proposed for the North Corridor of the 2030 Transit Plan. However, to see that this project has little to do with moving people and more to do with land planning and high density development, one just has to look at the CATS website for the project. The four options for the project are posted below. Option 1: Commuter Rail on Norfolk Southern's O Line. 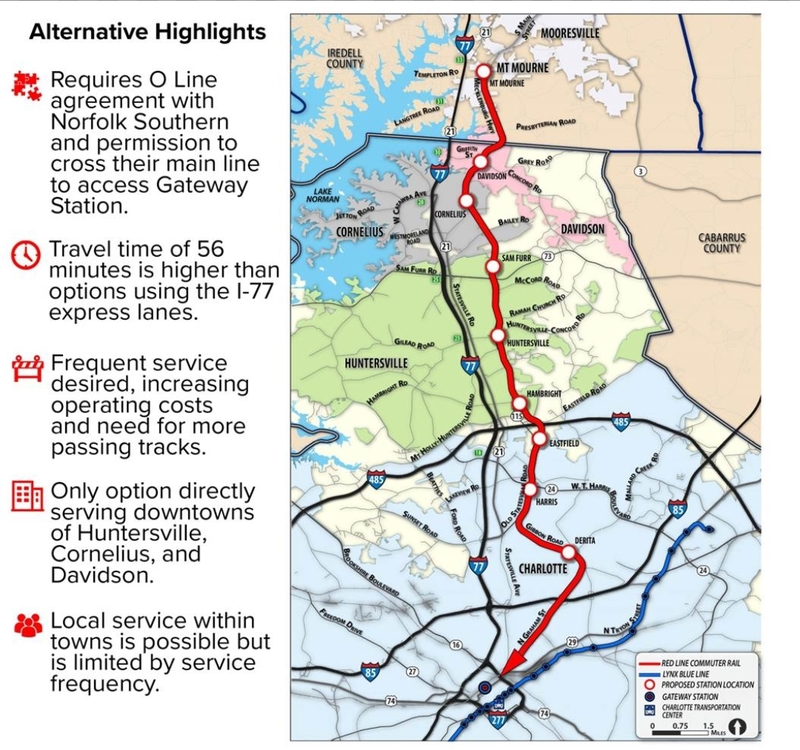 This option is the "original" - the one that was used to convince North Mecklenburg into voting for tax increases to build rail to the area. If it is built it will run through the North Meck towns. In Davidson in particular it would change the town's character. The inevitable gentrification it would cause would eliminate much of the racial and economic diversity in town. 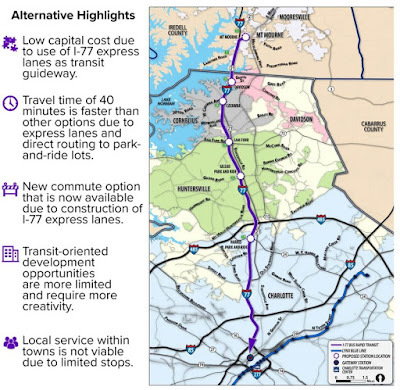 Option 2: Bus Rapid Transit (BRT) utilizing the I77 HOT lanes when that project opens in coming months. 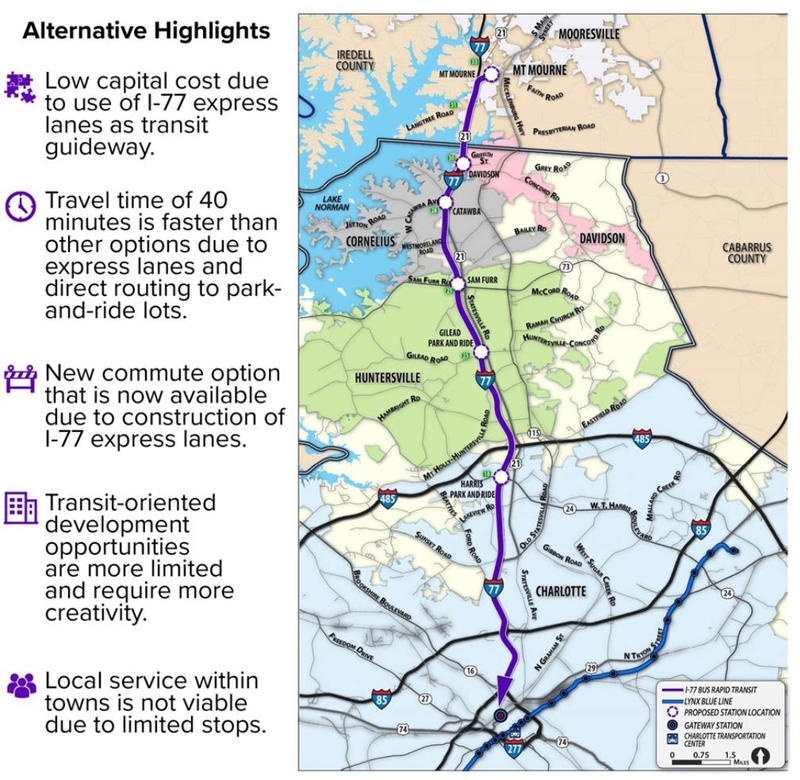 This option will cost the least, could be implemented the soonest, and provide by far the fastest service to Uptown Charlotte. (Note: Even though efforts continue to make major changes to the HOT contract, it is looking more and more likely there will be at least one HOT lane that could be used to support BRT service. Option 3: Light rail to Charlotte. Many people love the idea of Light Rail Transit (LRT) to Charlotte. However, this option will be the most expensive and take by far the longest to ride. The question you have to ask yourself is "Do I care more about riding on a train than getting to/from work much, much faster on a bus?" 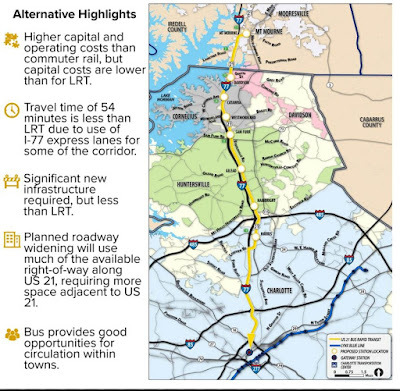 Option 4: BRT on NC21. 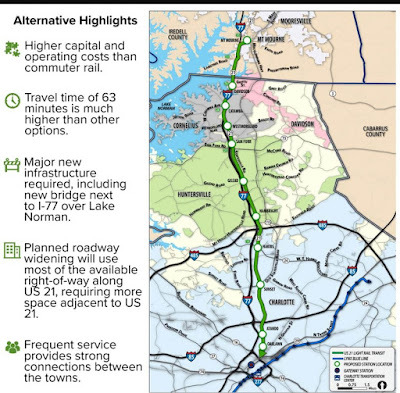 This option will be significantly more expensive than the BRT in Option 2 because it will need to acquire right of way for dedicated BRT lane along NC21. It will have a similar trip time as commuter rail. So, what do Options 1, 3, and 4 have in common over Option 2 other than being slower, more expensive, and longer to implement? They all support higher density development. In fact if there is a perceived drawback to Option 2 from the New Urbanist planner perspective (that's the perspective that drives all planning in the area), it is that Option 2 doesn't support high density development known as Transit Oriented Development (TOD) as well. 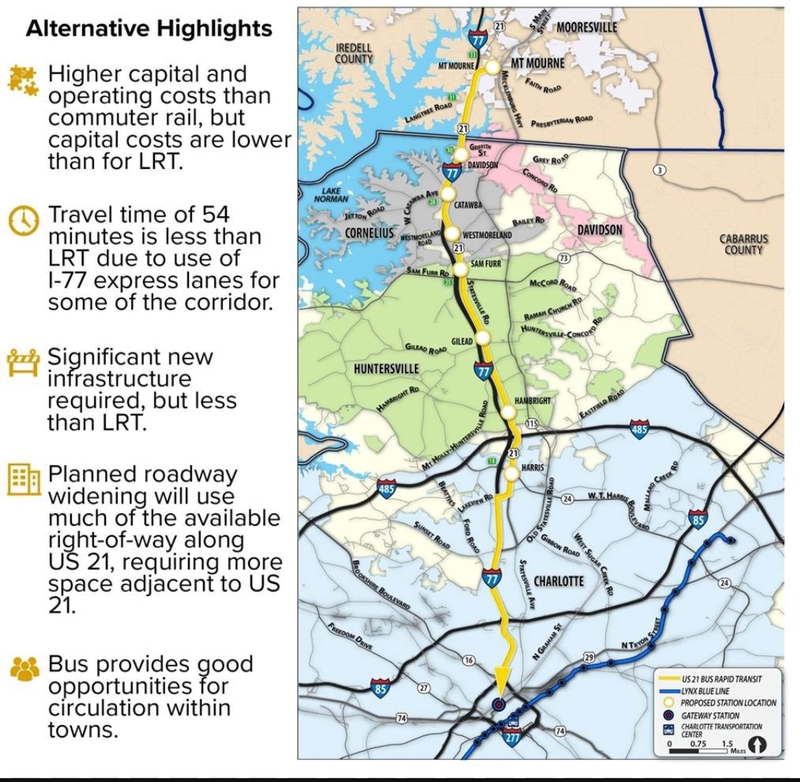 So as this discussion unfolds people need to keep this in mind, if development proposals in Davidson like the Linden, Potts Street, and Davidson Depot bother you, then you should only consider supporting a mass transit option like BRT on I77 under Option 2. Supporting anything else means you also support more small town character destroying high density development because that's what those options are designed to do.